Marc spent time with Chantelle exploring her preferences. Chantelle particularly liked the simplicity of clean modern design with curved lines and form so Marc worked on aligning all these elements in this modern and sophisticated ring. Jason and Chantelle say, “After we got engaged, we decided to see Marc to design something different and unique for an engagement ring. The end results were unbelievable. The stunning design, the amazing talent and skill of such a beautiful ring, followed by an equally spectacular wedding ring, blew us away. The quality of workmanship is world class, even other jewellers have commented on the beauty and craftsmanship. Angela asked us to design a ring that was classically simple with a touch of modern style. Marc’s design incorporated a shapely twist on a classic style, providing the necessary sparkle while maintaining an understated elegance. 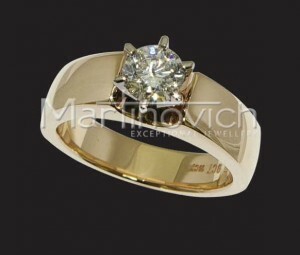 Angela says, “I cannot say enough about my experience with Martinovich Jewellers. My solitaire ring is absolutely stunning. The design work is beautiful and they designed a ring that is unique. They definitely came through for me with fantastic quality and service and the ring arrived in time for my wedding anniversary considering the short notice I gave them. I wouldn’t hesitate to buy from them again. During the consultation process, Bernadette indicated her preference for modern design but wanted to retain a degree of softness and movement. Marc skilfully incorporated these elements into the design to balance the modern and delicate elements and used an oval shaped stone to create a distinctive centrepiece. This ring exudes beauty and elegance. Bernadette says, “When Doug and I became engaged it was the most exciting and wonderful time. This special time of planning, organising and preparing for our wedding day started with the engagement ring. We spent several hours with Marc Martinovich discussing and crafting the ring that came to encapsulate much that was meaningful to us. Marc was fantastic to work with, very patient and very creative, he listened and responded to our ideas and created a ring that is stunning and unique. The experience that we had and the ring are simply perfect. Remaking an existing design meant Marc was able to spend time with Zivvy offering advice on the grade of stones and sourcing the perfect diamond for Zivvy’s engagement ring. Superb construction and an exquisite stone resulted in this sublime ring. Zivvy says, “Marc’s passion for excellence and individual perfection, facilitated by his expertise, knowledge and craftsmanship brought us our perfect ring! 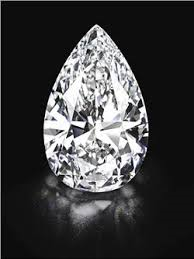 We started in the wrong place and had two ‘miserably failed’ attempts at finding a quality diamond ring through a large chain store. 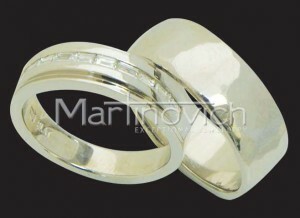 Our predicament led to discussions with various friends who recommended Martinovich Jewellers. I guess what first steered us away from an exclusive design store was mistakenly believing it was going to be too expensive. We were surprised to find that a relatively negligible increase in cost led to a very pleasing increase in overall quality and a significant increase in the valuation. Marc worked closely with Kevin and Mel to find out their personal taste. 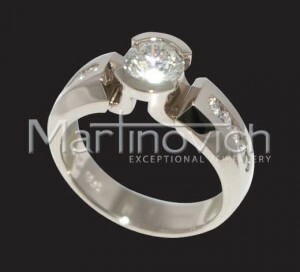 Through the consultation progress, Marc discovered that Mel wanted her ring to include both delicate and bold elements. 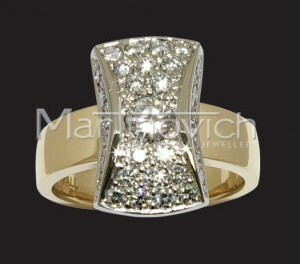 Marc’s design incorporated these elements into this distinctive ring. According to friends of the couple, this ring perfectly captures Mel’s personality. Kevin and Mel say, “We had experience of the great quality products that Marc makes and wanted to get something original, of excellent quality and suited to our taste for our engagement and wedding rings. 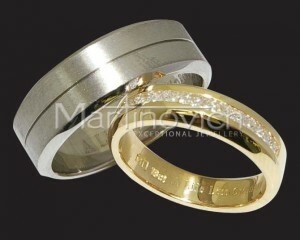 We are based in Auckland and worked through some ring ideas via emailing and telephone calls. As it worked out in the end, a half-day in a cafe in Queenstown for the bride-to-be brainstorming some final ideas of what we wanted cemented the final outcome. Bold, vibrant and vivacious best describe Jane’s taste. Marc worked closely with Jane to find elements of design that reflected her taste and helped her to select an asymmetrical stone that provided impact, colour and a point of difference. Jane says, “After a courtship of 17 years my partner and I decided to get married, and liked the idea of a one-off, personalized handmade ring rather than a conventional diamond ring and wedding band. 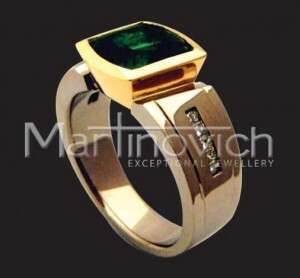 We approached Marc Martinovich, jeweller, gave him a broad outline of what we wanted, and were most impressed with his patience, professionalism and knowledge. After choosing my preferred stone, I looked through numerous photos of rings and picked out various details that appealed. In designing the ring, Marc also took into account aspects of my personality, and discussed with me at length what I liked and what suited my hand. I considered the latter to be important, as I don’t have pretty hands as such, and wanted the ring to feel and look “just right” for me, and symbolise our vows. While it is clear that Marc creates absolutely stunning jewellery, it was the personal interactive approach he uses that initially drew me to Martinovich. 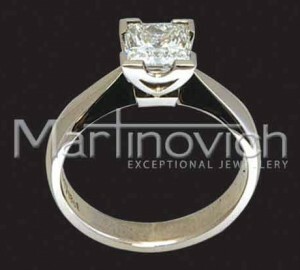 The process of working with Marc to create my ring was fantastic and far exceeded my expectations. Marc's intuition, creativity and insight, patience, and the respectful yet passionate approach he brought to the process was a pleasure to be involved with. I am now the delighted owner of a stunning and unique ring that reflects me in a way that I was not able to clearly articulate for myself. Marc has a rare talent in that he was able to envisage (and create) this ring for me so perfectly. Having the memory of the process allows me to enjoy my ring even more knowing it was such a personal creation.